Guest Review by Mellow Mummy. The Tooth Fairy 2 came out on DVD earlier this month. I don't normally consider myself to be the kind of person who watches movies of men dressed up in pink clothing but given that the movie had a PG certificate, I thought it was worth the gamble! 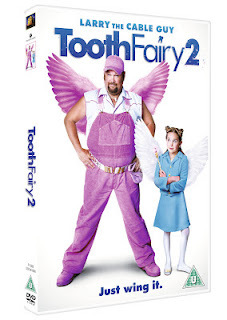 The Tooth Fairy 2 stars Larry the Cable Guy who is jilted for the town hot-shot. In an attempt to impress his ex, he volunteers at the local kids club. not long after starting, he slips up by suggesting the Tooth Fairy is a myth at which point he is transformed into a tutu-wearing, pink-winged fairy until he learns his lesson. The Tooth Fairy is challenged to collect 10 children's teeth in just 10 days and the movie follows his attempts. As the days pass he actually starts to enjoy himself and learns a few important lessons in life. As he does so, his ex (quite predictably) starts falling for him all over again but her new man isn't too happy about this and attempts to sabotage the Tooth Fairy. There were a number of funny moments as the boyfriend steps in to do his very best to throw the Tooth Fairy off and prevent him from fulfilling his challenge but we found the funniest parts to be the ones that featured Brady Reiter as the head fairy - very cute! This movie surprised me (it went straight to DVD so I had my doubts about it!) - our whole family enjoyed it and it had a great mix of comedy and emotion. You can buy it alone or as part of a double-pack with the original Tooth Fairy movie which stars Dwayne Johnson.